“Glow is a brand of RC car fuel from Jonker BV. 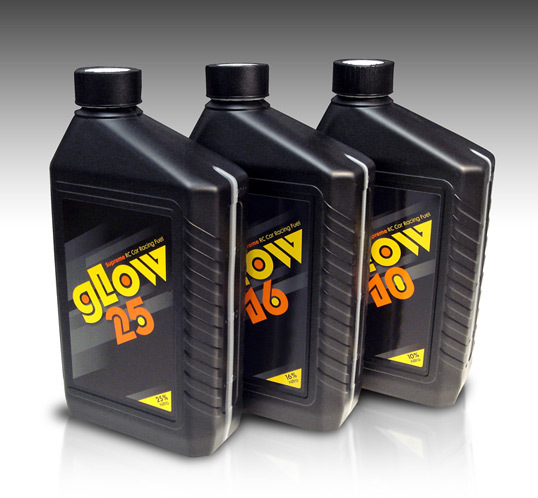 Where Tornado is their premium brand, Glow is a price fighter and because of this we decided to use plastic bottles. I don’t get it. What is so great about this? Black plastic bottle with label? 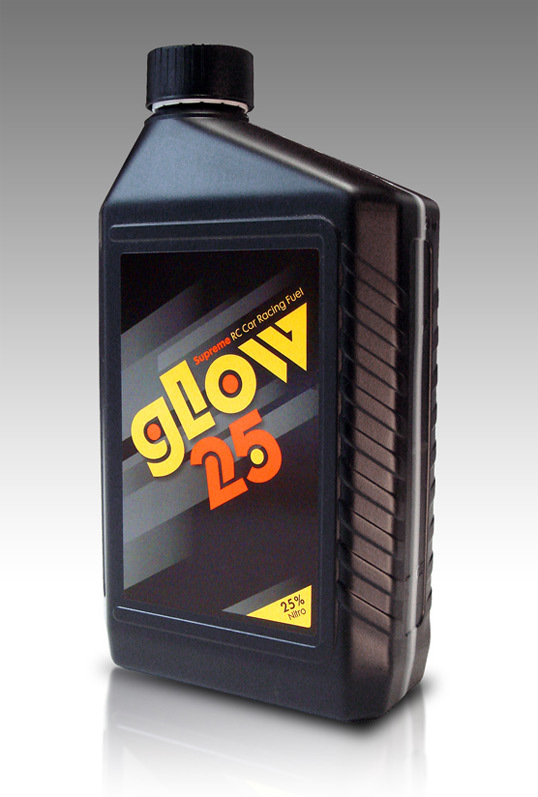 Has someone been drinking the Glow 25? How did this get posted? My student work you guys shot down was better than this, and the explanation didn’t contain any grammatical errors..
@Ben: Tornado, the mother brand, has a 35 year history and reputation. Have a look at the redesign we did recently: http://bit.ly/f6BYy1. We descided to preserve the brand image, and not just build it from the ground up. It would be a crime to throw away a solid reputation. People recognize Tornado by their red can and the lightning bolts. Glow Fuel should harmonize with Tornado, so the nature is pretty graphical too. You might call it outdated if you like. And whether you like it or not, is a matter of taste, I guess. 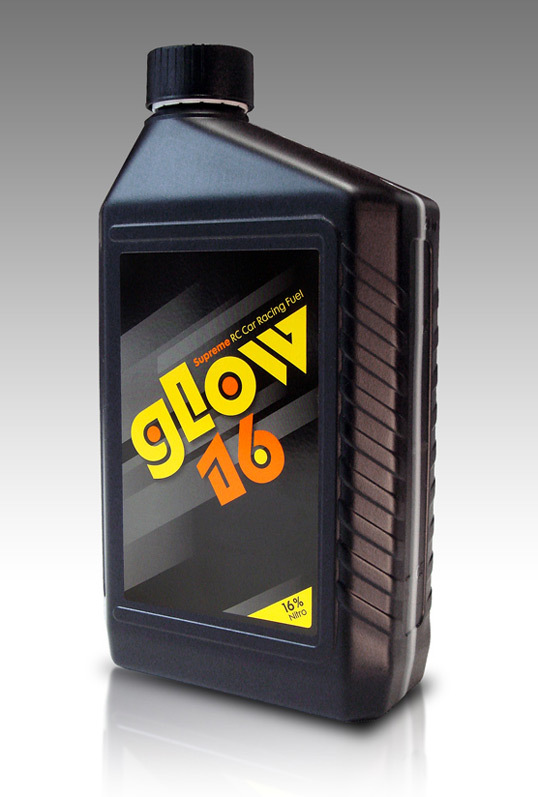 Where Tornado is the A-brand, Glow Fuel is a price fighter. The brand image should stay low-key on design, but high on quality though. It stands way out from their competitors, so what more can you want? Designing a unique appearance is the start for any good brand. @Jeff: It tasts a bit like wodka red bull. Rene Verkaart made his point and looks like a professional and a good sport. However I thought this blog dealt with innovative designs in packaging, so I think this project isn’t getting much credit because it’s off topic. I’m sure lovelypackage readers would be happier if a little something had been added …like, I don’t know… making the cap look like a little wheel from an RC car? But then again a mold for a little plastic cap costs a lot money and if I were the customer I woldn’t necessarily consider it a good investment. @Randy: The beautiful thing about commercial design is that it’s so subjective. We don’t expect everyone to love everything we showcase. @Randy: Thanks. I get what you’re saying and I’m well aware of the fact that this is not so innovative as many other great designs on this website. Glow is a price fighter, so the look-and-feel had to fit that concept. Anything else can soon become over-designed which imho would not fit to the low budget market.